Witches in the His Dark Materials series live for hundreds of years, and what a life Serafina Pekkala (and her dæmon Kaisa) must have had! I would love to read about her adventures and particularly her time spent with Farder Coram. It would be a very sad love story. I have recently finished Tartt’s latest novel, so it’s still fresh in my mind. There are two characters that I would like to get to know better. The first is gentle, trusting Hobie. Tartt briefly mentions his unhappy younger years, before he met Welty. It would be interesting to learn more about the events leading up to his move to New York. My second choice from The Goldfinch is (of course) Boris. And how could it not be? He’s a chaotic character and I can only imagine what would show up in a book about his life – both before and after his friendship with Theo. Jem is a real favourite of mine. He’s a complex character; a bit of a bad boy, but charming and kind. He’s probably been in enough scrapes to make a great story. Jordan Baker misses out on a lot of the limelight in The Great Gatsby, but I like to think that there’s more to her character. What does she do with her life after her and Nick Carraway part ways? Olenna Tyrell, otherwise known as the Queen of Thorns, is such a feisty character. She’s one of the reasons women should love the A Song of Ice and Fire series – I bet she has a few stories to tell. Miss Betsey Trotwood is one of my favourite characters in David Copperfield. She’s independent, generous and extremely stubborn. We don’t know the details of her unhappy marriage but there must be a story in there somewhere. 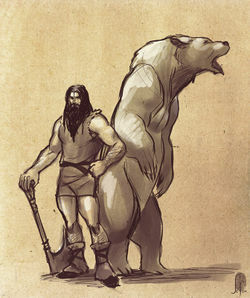 Beorn the ‘skin changer’ is one of the most interesting and mysterious characters in The Hobbit. He’s fierce and dangerous (he can change into a bear!) but he is also gentle and caring, especially towards the intelligent animals that live with him. He has an important part to play in The Hobbit, although we don’t see that much of him. It’s possible that there is already a book about his past – if so, I would really like to read it! Not only is Kingsley Shacklebolt a top Auror, he also ends up as Minister for Magic. But what did Kingsley get up to when Voldemort was powerful in the pre Harry Potter days? And, most importantly, I’d like to see what was going on behind the scenes while Harry was at school. Which characters do you think deserve their own books? I would very much like to read stories focused on Betsey Trotwood (she is one of my favorite characters in Copperfield too), Beorn, and Kingsley Shacklebolt. Brilliant characters all. I love these picks! Yes yes yes to your Goldfinch, Gatsby, and Potter ideas. This is a lovely idea! Has got me thinking about all the characters in books I have read that come and go throughout the story and left me wondering where they were. Karla in Shantaram?